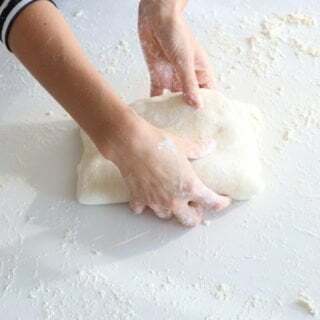 Learn how to master the technique of a puff pastry and prepare it from scratch with the help of this useful step-by-step guide. 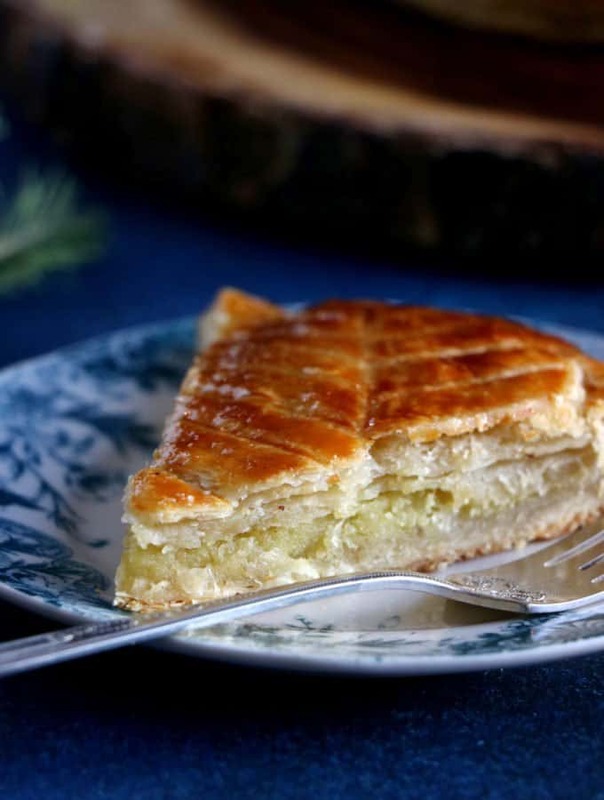 Your fruit pies and other pastries will reach a new level! Puff pastry has always scared me. To me it seemed very technical, extremely long and terribly boring. A little while ago however, encouraged by a good friend of mine, I threw myself into the water and baked it from scratch. I was so proud that I crafted a step-by-step tutorial for the puff pastry in order to guide you when baking it. 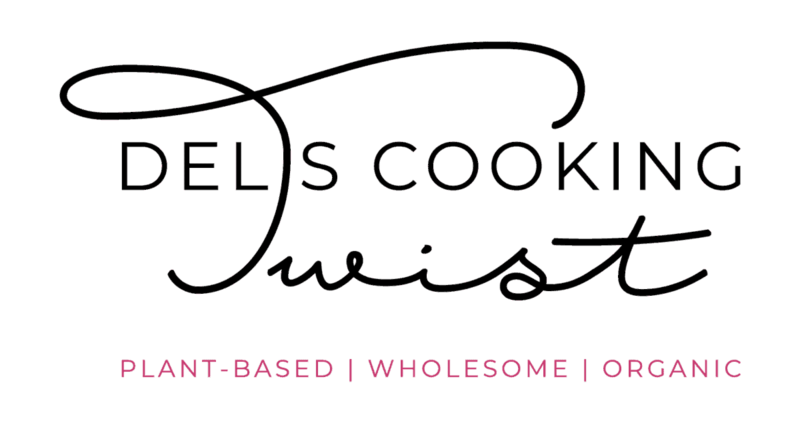 This way, you can follow the instructions one by one, making sure you don’t go wrong at any time in the recipe. I will not lie to you here, it is indeed with no surprise a little technical and it requires both time and patience. If you don’t have either of them at the moment, don’t blame yourself, there is absolutely no shame in it. You can still be a very good baking aficionado without baking your own puff pastry. 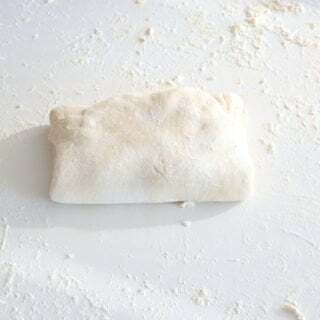 There are a few important things to keep in mind when baking a puff pastry. 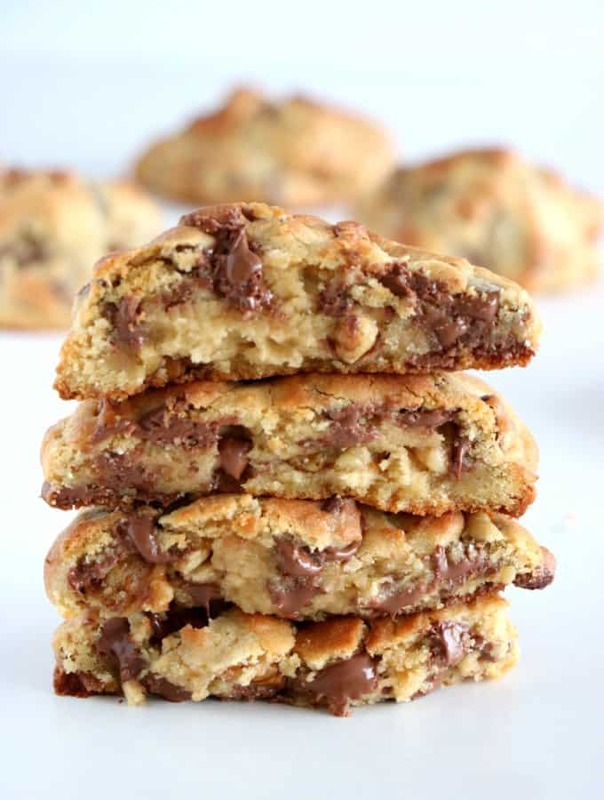 To begin with, you will notice that the recipe calls for only 3 basic ingredients, mainly flour and butter (+ water). At this stage, you start by preparing a beurre manié, i.e. 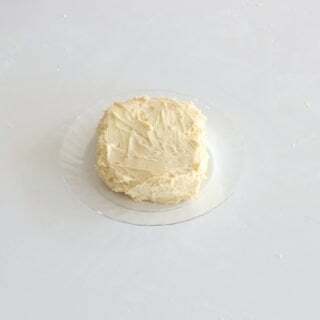 a dough consisting in equal parts of soft butter and flour. 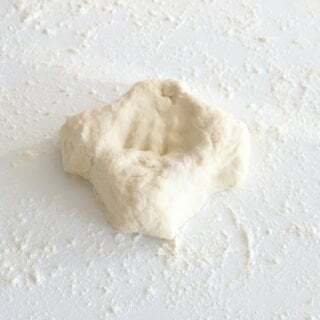 By kneading the flour and butter together, the flour particles are coated in butter, preventing the latter from being too sticky when combined with flour later on. From now on, and until the end of the recipe, one rule is king: always work with a cold dough. 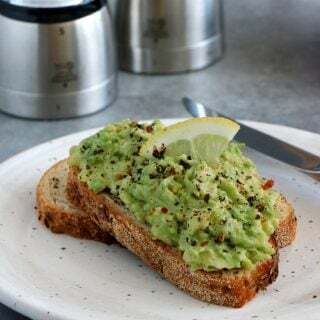 If it’s too warm (even lukewarm), place it in the refrigerator until cold again. 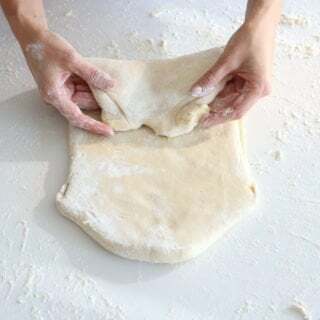 Then, I count 2 tricky parts when making a puff pastry: the folding and turning part of course, and the ability to keep butter inside without poking through it at anytime. The folding and turning part was indeed the one I was most afraid of, but by following my step-by-step guide, you should be able to do it without getting lost. Following recommendations of a Pastry Chef friend, it’s important to take your time and leave the dough to rest/chill between turns, ideally once or twice during the process. For instance, start with 3 foldings and turnings the day before, and the remaining ones on the baking day. 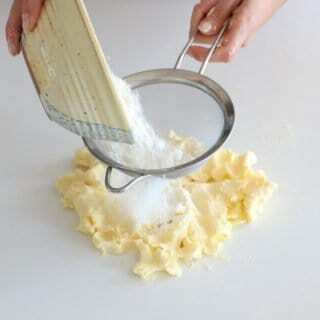 As for the second point, it’s important to be very careful when you flatten the dough so that the butter does not come through at any time. 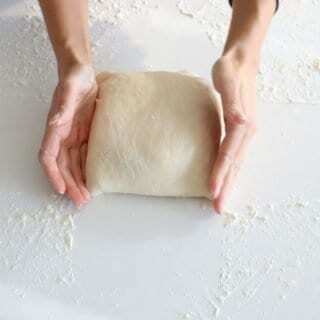 It would damage the dough and make the puff layers uneven, which of course you do not want here. 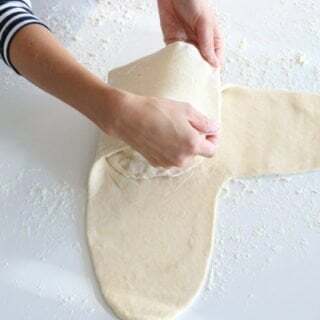 The best way to avoid this phenomenon is to gently flatten the dough with a rolling pin instead of rolling and stretching it out. 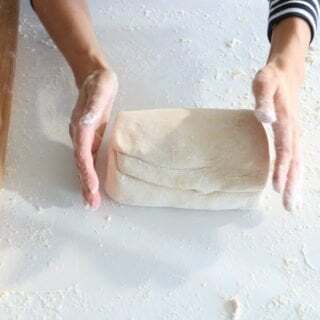 If by accident it happens to you, do not feel defeated and try to hide the buttery part inside the next folding so that it is trapped between two layers of dough. 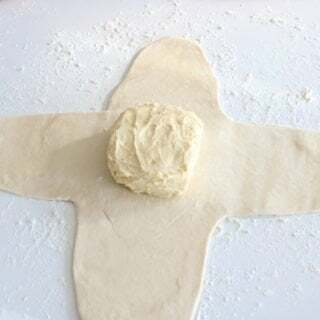 When the puff pastry is ready to use, roll it out and cut 2 circles or a large rectangle, depending on what you want to use it for. Step 1: Puff pastry ingredients. Step 2: Beurre manié ingredients. Step 3: Sift in the flour in one addition. 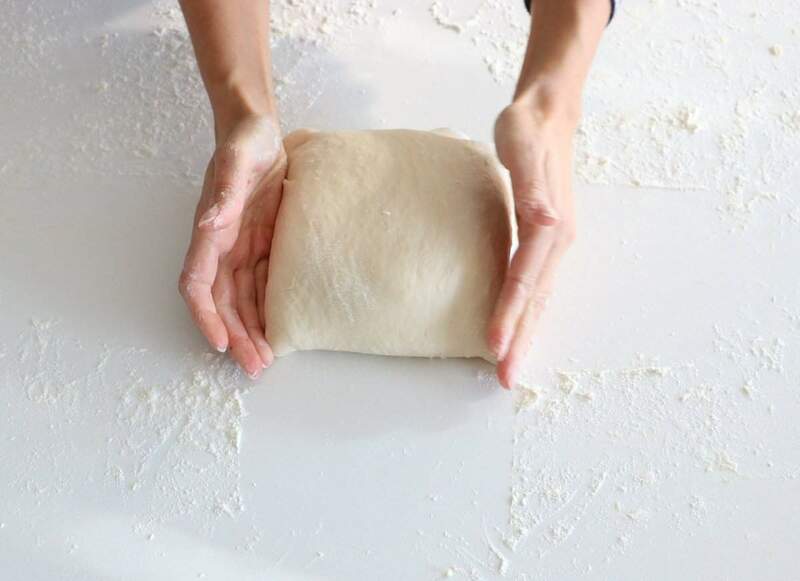 Step 6: … until a soft and smooth dough. Step 7: Shape into a square. Step 8: Run your fingers down the center to create a trough. Step 9: Pour water, little by little. Step 11: … and holds together when pressed. Step 12: Shape into a ball. Step 14: … into a cross with 4 arms. Step 16: … toward the outside. Step 17: Place the beurre meunié in the center. Step 19: … so they meet in the middle. Step 24: With the last arm, make sure to cover all over. Step 26: … a long rectangle. Step 27: Fold the top third over the bottom third. Step 28: and the bottom over the top third, like a letter. Step 29: The 1st tour is done. Step 31: … so it looks like a book about to open. Step 32: Start turn 2, repeating all the steps from 25 to 29. Make 6 turns in total. 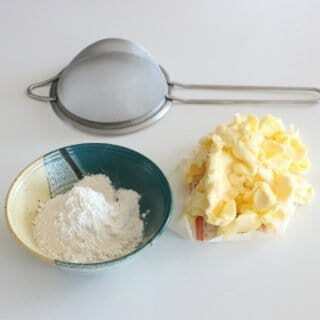 BEURRE MANIÉ: rub buter with your finger tips, then add the flour in one addition. 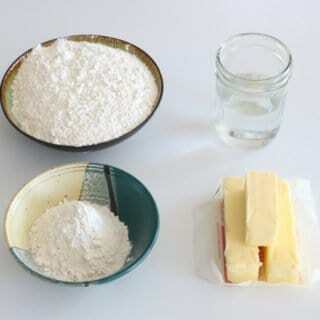 Rub in together butter and flour until a smooth dough. 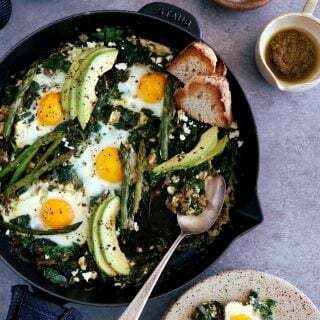 Shape into a thick, compact square. Wrap into cling film and place in the refrigerator. 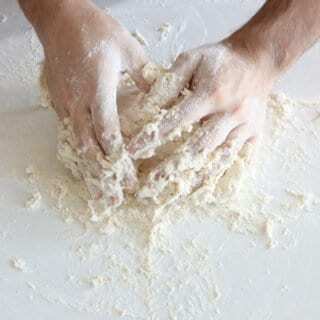 PUFF PASTRY : mix the flour with the salt, then turn out onto your work surface in a pile. Run your fingers down the center to create a trough. Sprinkle 1 tablespoon of water into the trough. 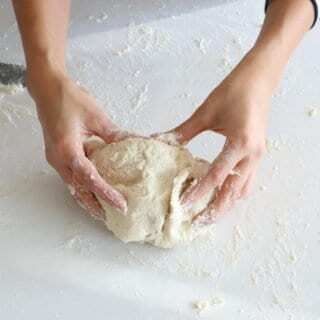 Quickly fluff the dough with your fingers, keeping your fingers loose and using a scooping motion. 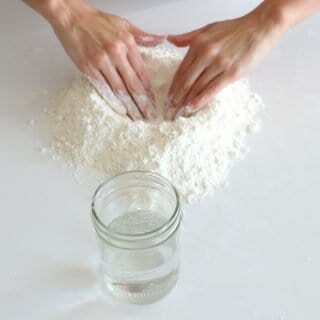 Gather the flour back in to a mound, create a trough, and add another tablespoon of water. 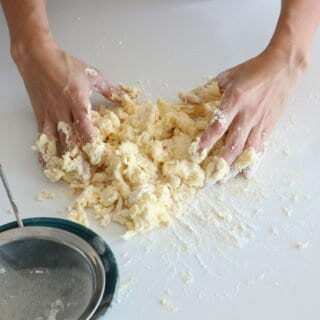 Continue sprinkling and fluffing until the flour clumps together in large pieces and holds together when pressed. 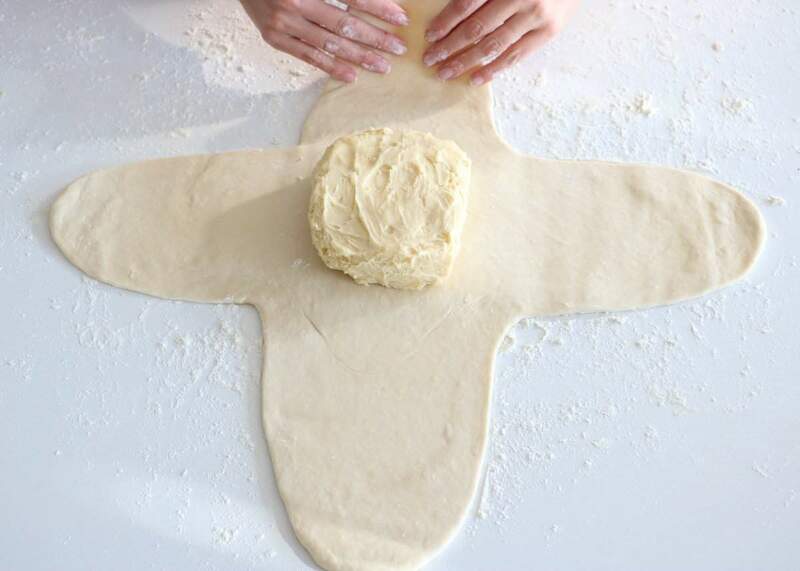 Shape the dough into a cross with 4 arms, keeping the center part a little bit fluffy. 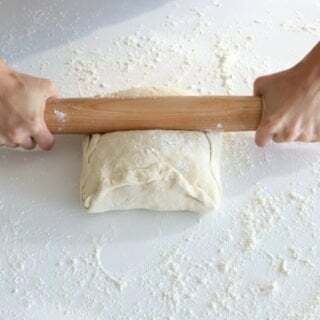 Roll out each arm toward the outside, using a rolling pin. 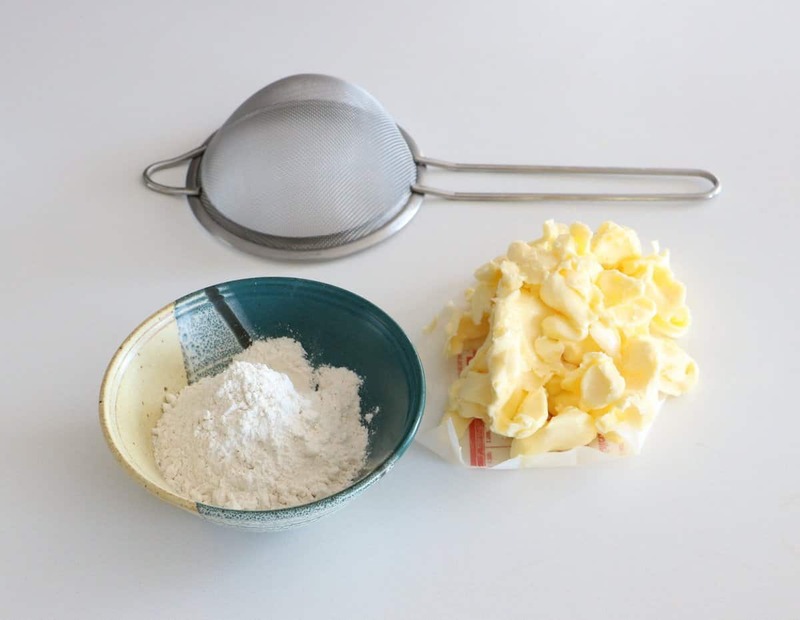 Place the beurre meunié in the center, then fold each arm of the dough over the butter so they meet in the middle. With the last arm, make sure to cover all over, including the sides. 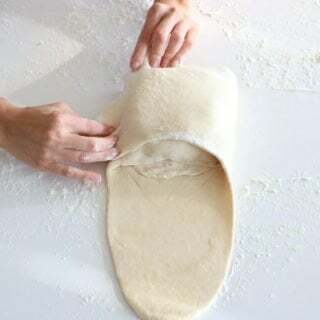 For the 1st turn: using a rolling pin, gently shape into a long rectangle 12 inches by 6 inches ((30,5 X 15 cm), tapping the dough rather than rolling it, so that you spread the butter from inside without piercing the dough. Fold the top third over the bottom third, and the bottom over the top third, like a letter. The first tour is done. 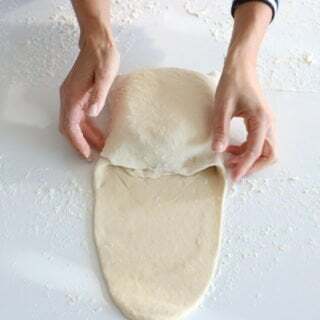 For the other turns: rotate the folded dough so it looks like a book about to be opened. Roll it out again into a rectangle 12 inches by 6 inches. Fold it again. Make 6 turns in total. My advice: start with 3 tours, then wrap the dough into cling film and place in the refrigerator. Remove a few hours later, ideally the day after, and make the 3 remaining turns. Vraiment superbe ce pas à pas ! 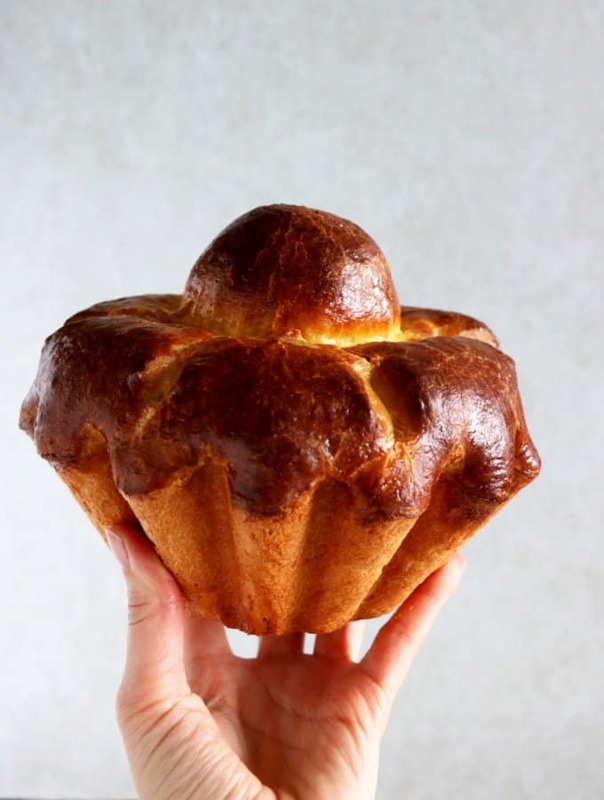 Tu vas réaliser des croissants ou pains au chocolat avec pour le goûter ? Greeting from Bangkok, Thailand. 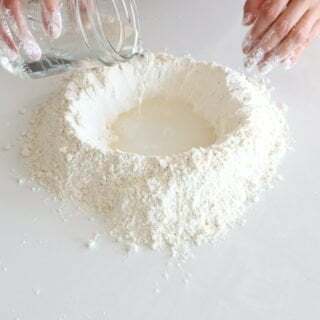 This weekend coming I would like to make a croissants whether I could use your recipe, but you don’t add any yeast in the recipe. Will it be ok for the croissants. I’m just wondering it. Look forward to receiving your reply.